Making roti is a very important and needful job for us, especially for the women in our house. Everyday, we need to eat and rotis are one of the most preferred food for Indian community. But making a perfect roti needs practice and experience. At the same time, you also need to put enough effort. But roti makers makes this job very easy even for beginners. That’s why today’s article is about the best roti maker in India 2019. In this article, we will feature the top 5 best roti makers in India 2019 in terms of their usability, affordability and availability at online stores. Now a days, there are tons of roti makers available at both online and offline retail stores. But most of them come from unknown brands which we don’t even heard about in our entire life. Unknown brands will cost you less. But they won’t work well or after sometime they may not work at all. On the other side, there are also some good and well-known reputed brands such as Prestige, Bajaj, Sunflame, Maharaja, etc who also manufacture some of the best roti makers in India. So, today, we will be looking at best roti makers in India 2019 which are from the top cooking brands and offers most out of it’s price or in other way, provides the most value for money. So, without any further do, let’s get started! 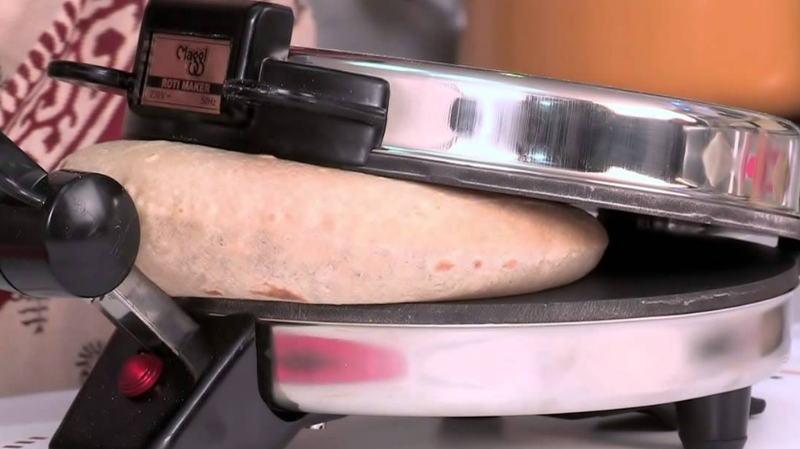 These are the top 5 best roti maker in India 2019. We have ranked them according to the features, performance and price. Just select any of them which you like most and place the order online if you want to purchase from the most trusted online shopping stores. If you order online, roti maker will be delivered to your home within 1-4 days. However, you can also buy it from your nearest offline shop. But, as less number of middle-mans are involved in online shopping sales, you could get the same product at cheap price. Apart from that, few bank cards also avails you extra instant discount on top of normal price which is already a lot cheaper than the MRP. That’s why, we recommend you all to buy roti maker online. Bajaj is such a brand which is trusted for more than 60 years now. This Bajaj roti maker comes with the automatic cut-off function which gives you the perfect sized light and fluffy rotis. Forget the traditional hard ways to make rotis. Use this modern roti maker and it will make you happy and the job of making perfect rotis will be fun for you. It’s size is so compact that you can bring it with you from one place to another place easily in your bag. The design is also stylish and it will make your kitched modern and glow both in terms of view and performance. 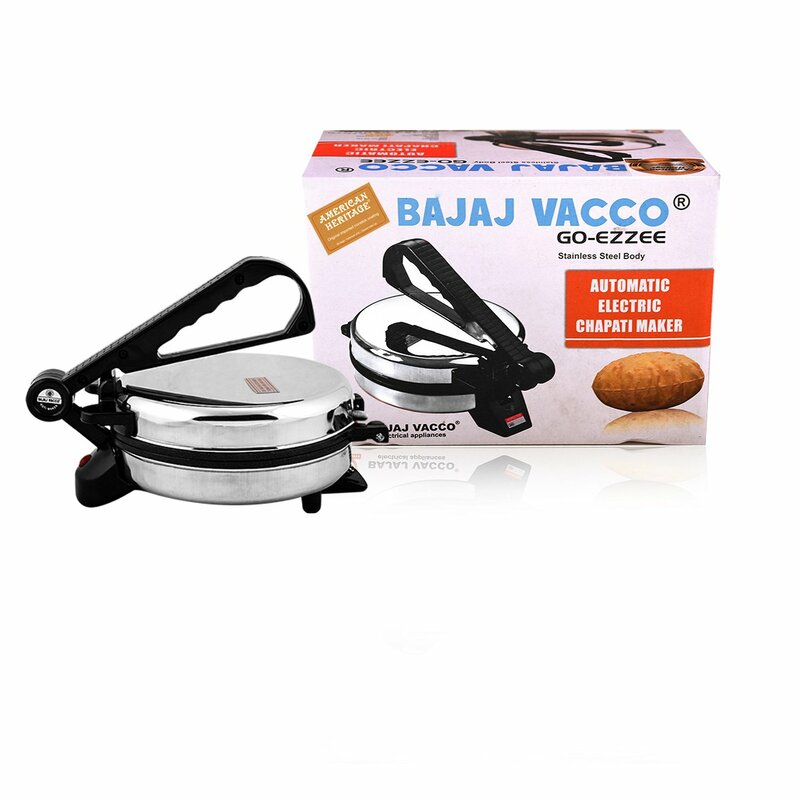 Some of the unique features of this Bajaj Vacco roti maker are strong ABS plastic handle to press, heat resistant knob to lift, non-stick coating which keeps it cleaner and don’t let your rotis stick to it, power indicator light, shock proof casing which protect yourself from electricity, durable and stylish stainless steel body. Prestige PRM 4.0 is in the 2nd position in our best roti maker in India 2019 list. But, this one comes with even more stylish and futuristic look. This also has nonstick coating in it. You can operate this Prestige roti maker at 900 watts of power. Another plus point for buying this roti maker is, it comes with a heat control knob which lets you set the temperature level so that you can make rotis at perfect temperature and avoid over heating and extremely dry rotis. But you can increase the heat too to make rotis quickly when you are in rush. 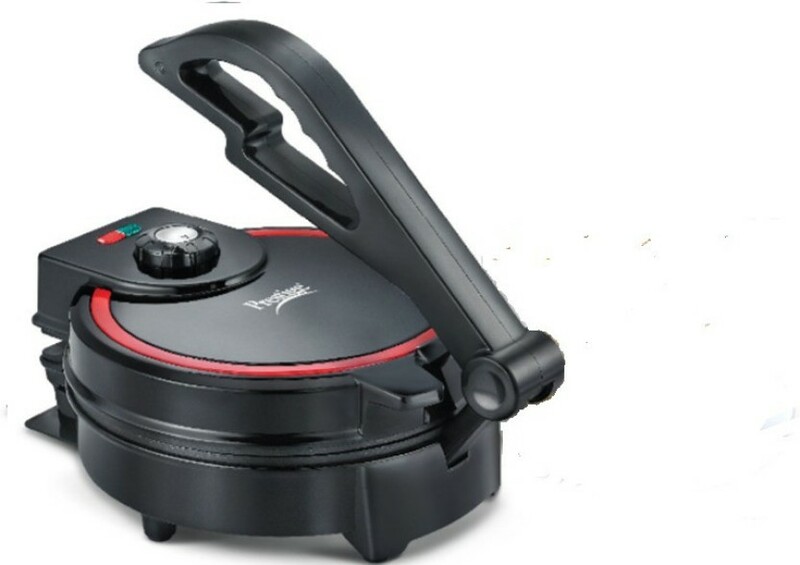 This Prestige roti maker also provides you 1 year of warranty. And Prestige repair centers are well spread across India so you can easily visit any of them and fix any issues happeing with this roti maker within the warranty period. 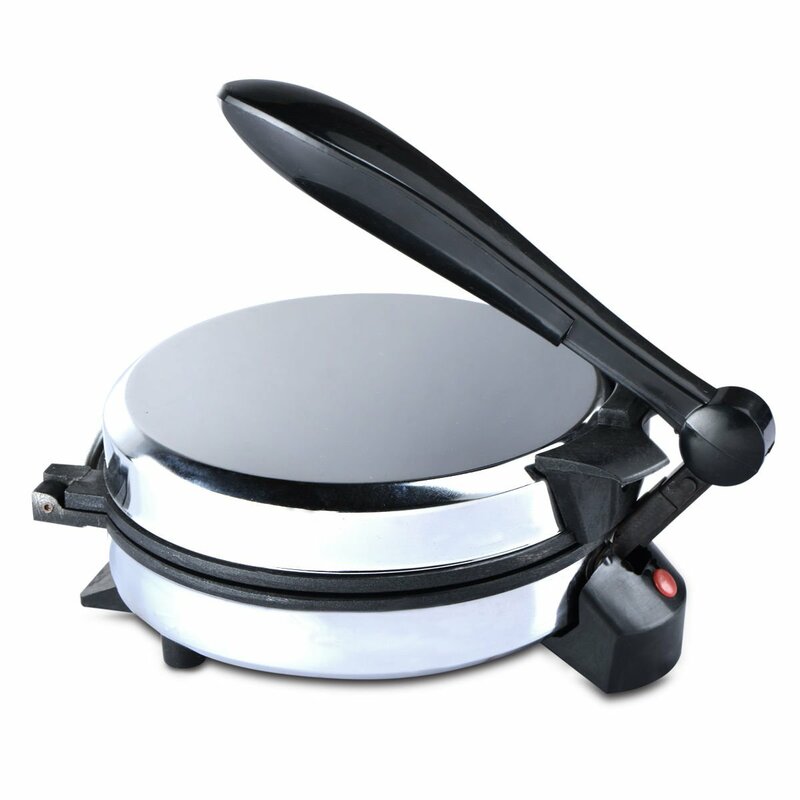 This roti maker from Sunflame is available in two different colors, Silver and Black. Though Sunflame is a lesser known brand in cooking industry, but still it already has a large number of customer base in the country. People are also satisfied with their products. At the end, it also comes with 1 year of warranty period so you don’t need to think about the warranty. This Sunflame roti maker has several features such as uniform heating, oil free cooking, nonstick coating, etc. The look and material quality is also fine. If you have any query about this Sunflame roti maker, you can even contact to the Sunflame care through mobile number 01292274608 or email at customercare@sunflame.com. 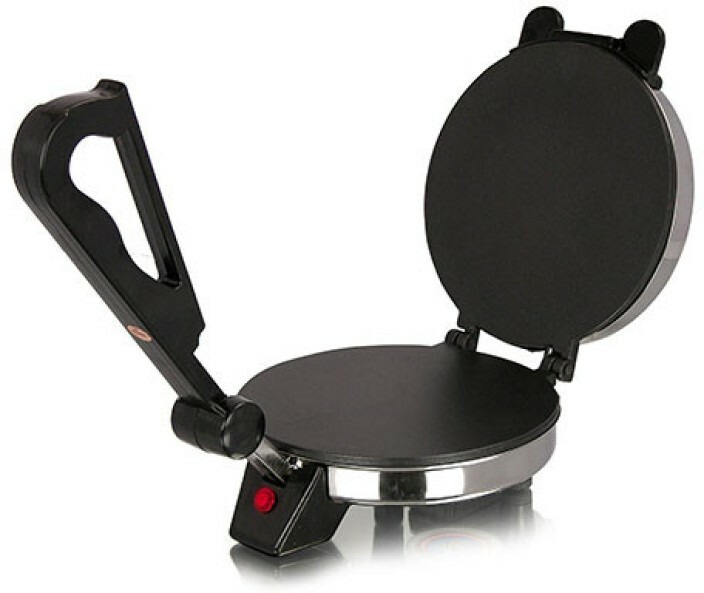 This roti maker comes with the most affordable pricing at Rs 999 only. But still, it has plenty of features. The complete outer is made of pure stainless steel with nonstick coating. It also consumes less power. The overall quality of this roti maker looks very premium. If you buy it from Flipkart now, you will also get 5% instant discount on all Visa credit or debit cards. Not only this, Axis Buzz Credit card users will also get 5% off on this Eagle Roti Maker. Flipkart also provides 10 day replacement policy so that you can easily return the product and get a new one delivered for free if there is any problem or malfunction with the roti maker. This is in the last in our best roti maker in India 2019 list just because it’s a new brand in this industry. But it offers really greater experience than some of the old well-known brands. 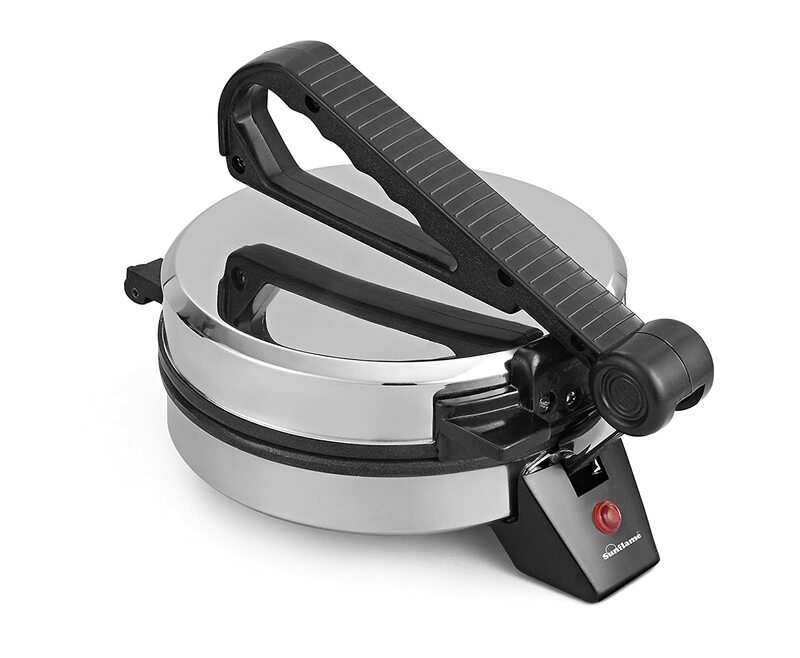 This jumbo roti maker is made of stainless steel body. The inner portion where the rotis are made is coated with non-stick coating so that rotis don’t stick into it. Plus it also has the power indicator. The press handle is also made of good quality plastic and there is also a knob to lift when the roti is made completely. The whole package comes in totally shock proof housing so that you never get a shock while making rotis. Jaipan is already known for it’s customer satisfaction centrality. So, you can buy it without hesitating anymore. Hope you have found the best roti maker in India 2019. If you have any further question, leave in the comments below. We’ll reply you as soon as we can!